When analyzing the history of hockey, few names carry as much significance as Gordie Howe. Known as "Mr. Hockey," Howe is widely considered to be one of the greatest hockey players of all-time, alongside Wayne Gretzky and Bobby Orr. It was not just his impressive stats or individual and team achievements that made him great. With a career that spanned five decades, he offered both quantity and quality over his time in professional hockey and his longevity was unmatched. All this combined to cement his place among hockey royalty and his cards are some of the most-pursued in vintage hockey. 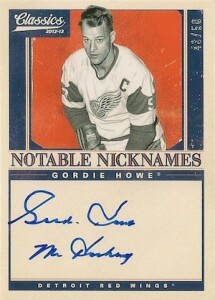 Shop for Gordie Howe cards on eBay. 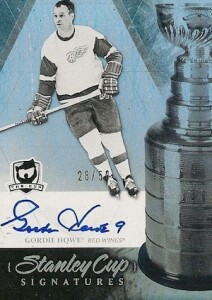 The following list documents ten of the best options for Gordie Howe card collectors. 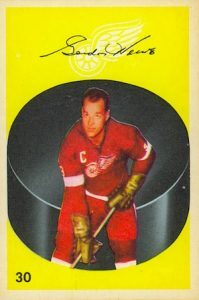 While the guide centers more on cards issued during his career, there are plenty of great Gordie Howe cards issued in modern sets, as well as others from his playing days. 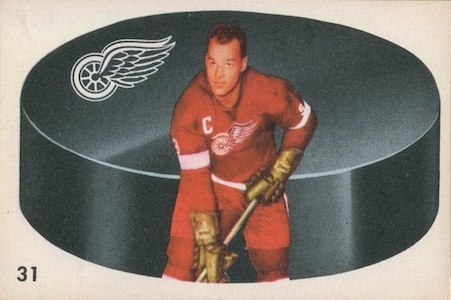 Are there any special Gordie Howe cards in your collection? Feel free to note it in the comments. Click on the links or images to shop for individual cards. As far as cards go, this one may appear to be pretty plain. However, this is no average piece of cardboard. 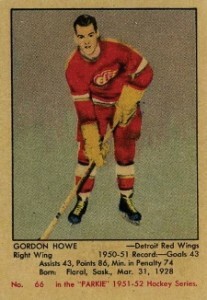 Gordie Howe's rookie card is one of the most popular and valuable vintage hockey cards of all-time. The 1951-52 Parkhurst set is very condition sensitive and prices can vary for this rare rookie card. Even poor versions carry strong values and prices rise quickly from there. Also, counterfeits are a problem. Check out our Gordie Howe RC guide to make sure you are getting the real deal. While it is certainly not a cheap card, this second-year release is a great option for collectors who want an early Gordie Howe card but can't or won't drop a grand or more for a hockey card. Sporting virtually the same image as his rookie, 1952-53 Parkhurst includes a larger image, brighter colors, and a much cleaner design since the stats are not on the front. The card also incorporates a facsimile signature. What a difference a few years can make. As far as the print quality, 1953-54 Parkhurst looks like a decade worth of improvements have taken place in comparison to the previous two editions. The layout is similar to 1952-53 Parkhurst with a white border and facsimile autograph. Quality printing and vivid colors combine to make the 1954-55 Topps Gordie Howe card one of the most visually-pleasing of the bunch. 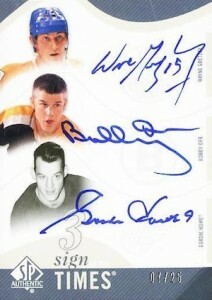 The set also has the distinction of being the very first hockey product from Topps. Several years passed before the second hockey product from Topps was released. The 1957-58 Topps design takes a step back from 1954-55 Topps, more resembling the early Parkhurst design. 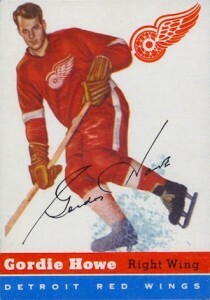 This Gordie Howe card goes heavy on red and features a white border. 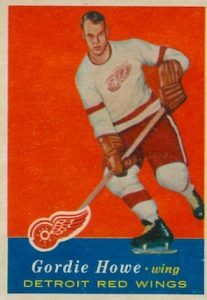 1962-63 Parkhurst includes two different Gordie Howe cards in the base set. The first card (#30), on the left below, includes a bright yellow background and large puck. 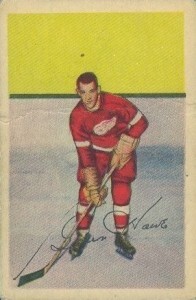 The image of Howe is included on top of the puck and a Red Wings logo and facsimile signature complete the card. The second card (#31) features a horizontal layout and most of the same components as the vertical card. Both cards showcase the number on the card's front. 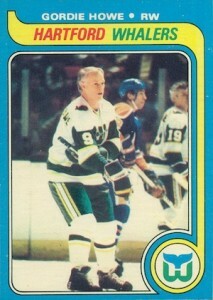 Tall-boy cards would eventually spread across the hobby, but they made their first appearance in 1964-65 Topps Hockey. 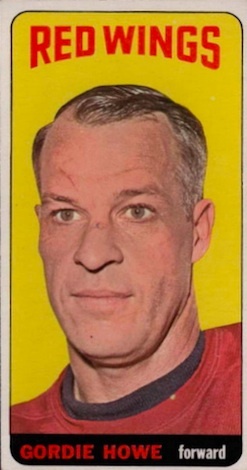 Showcasing a close-up profile shot of Gordie Howe, this card is one of the top options from this popular vintage hockey set. While there are multiple short prints in the release, Howe is not among them. As the last card issued while Gordie Howe still roamed the rink, this 1979-80 OPC and Topps card holds more historical significance than monetary value. Still playing professional hockey at 51, Howe would turn the hockey torch over to a young 19-year-old who debuted during the same season. Collectors can also find the rookie card for the budding star in question, Wayne Greztky, in this product. 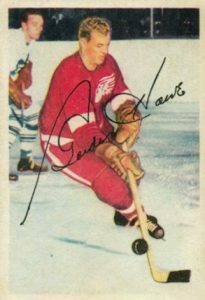 The first Gordie Howe autographed cards emerged in the middle of the 1990s and many more have followed since then. A majority of the releases feature limited print runs, and cards with inscriptions and on-card autographs are some of his most popular collectibles. Taking the Gordie Howe autographed card to the next level, the former great has been paired with other Hall of Fame players to make for a very intriguing collectible. 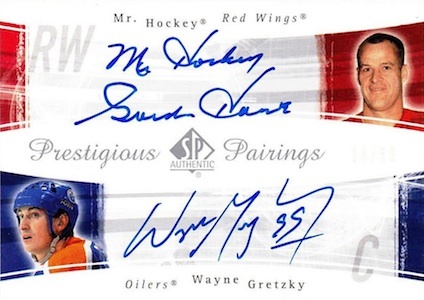 Among the many dual and triple autographed cards, fellow greats like Wayne Gretzky, Bobby Orr, Bobby Hull and Steve Yzerman are some of the most common pairings. I have a Parkhurst reproduction of the 52 tallboy signed by godie Howe…what would be the value in dollars and where does it fit in the Top scales of collections? 1969-70 O-Pee-Chee OPC GORDIE HOWE SGC 98 (10) GEM MINT - NO NUMBER (193) HOF! !